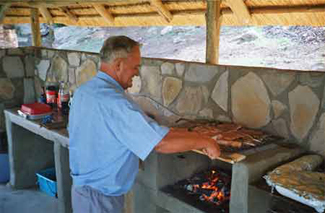 Light meals and braai packs available on request. Booking is essential to ensure your privacy. 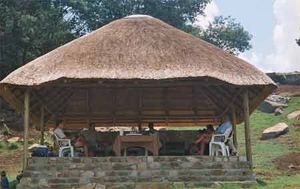 McCorkindale's Cave is 50 km from Ermelo and 21 km from Chrissiesmeer on the Lothair Road. 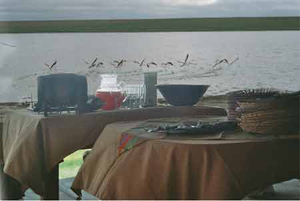 Braai facilities look out over the lake. Alexander McCorkindale was a Scotsman who arrived in South Africa in 1856, together with his wife, Mary-Ann and some 70 other settlers, most of them family members. He was able to make an agreement with the then Transvaal Government to sell him some 200 farms on which to settle European immigrants. Their task would be to produce live stock and farm produce. These farms were spread all over the province. In 1865 he returned to England and Scotland to set up colonization companies. He had very good relations with President M W Pretorius whose daughter, Christina, accompanied the party. The town of Chrissiesmeer (Lake Chrissie) in the new Scotland region was in fact named after this Christina. In 1867 Alexander settled some 50 souls in the Chrissiesmeer district. At that time he lived in a cave on the farm Lake Banagher, while he was busy building a cottage, which still stands today. 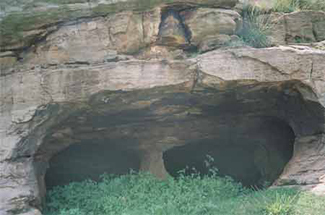 The McCorkindale Lapa is situated at the mouth of the cave. He died childless in 1871 of malaria.